Hello! Here I am, a little more than a month after my accident. I still can't walk, I hae another month or two before I can put any weight on my leg. I'm starting rehab next week, and working on trying to go visit my mom so I can lie around her house and have her take care of me. Alex has been amazing through this whole thing. He has been so patient and wonderful, taking over both our roles, walking the dog, doing all the shopping, cooking, cleaning, and laundry. We have been eating well. I've been devouring magazines, both bridal and food, and caught a recipe in this months Gourmet that seemed pretty quick and easy. I need meals I can serve myself when Alex is at work or out somewhere, and this picnic in a jar article they had seemed perfect! All I had to do was go get a jar out of the fridge and it was a full lunch!! He made it last night, and it's delicious. Cook onion, garlic, and ginger in oil over medium low heat, stirring occasionally, until softened, about 5 minutes. Add curry, cumin, and a big pinch of salt and continue cooking, stirring, about 2 minutes. Add tomatoes and cook over medium-high heat, stirring, until sauce is thickened, about 5 minutes. Transfer to a bowl and stir in yogurt, cilantro, and chicken. Cool to room temperature. Heat oil over medium-high heat until it shimmers, then cook chickpeas, stirring, 1 minute. Add cumin, turmeric, cayenne, and 1/4 teaspoon salt and cook, stirring to coat, until skillet is dry, about 2 minutes. Cool to room temperature. Stir together yogurt, cucumber, mint, and 1/2 teaspoon salt. 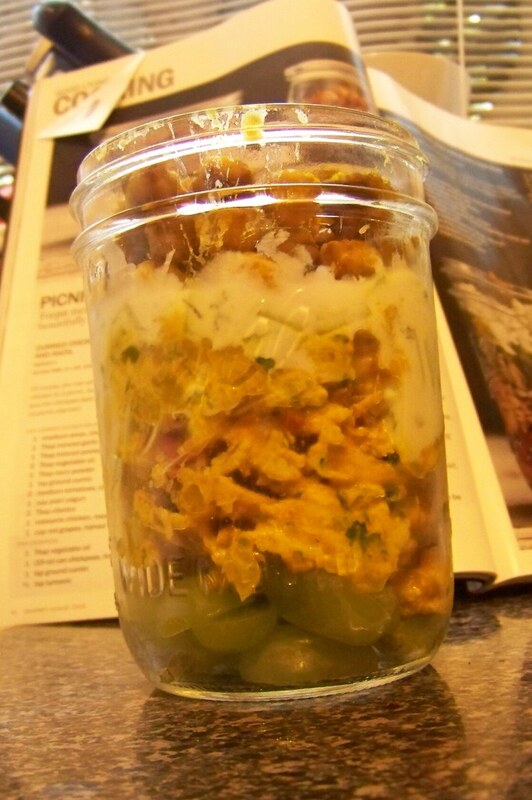 Divide grapes among jars and layer curried chicken, raita, and chickpeas. Glad to hear that you are doing better. Why can't these things ever happen in the winter though, when you don't want to go out anyways.